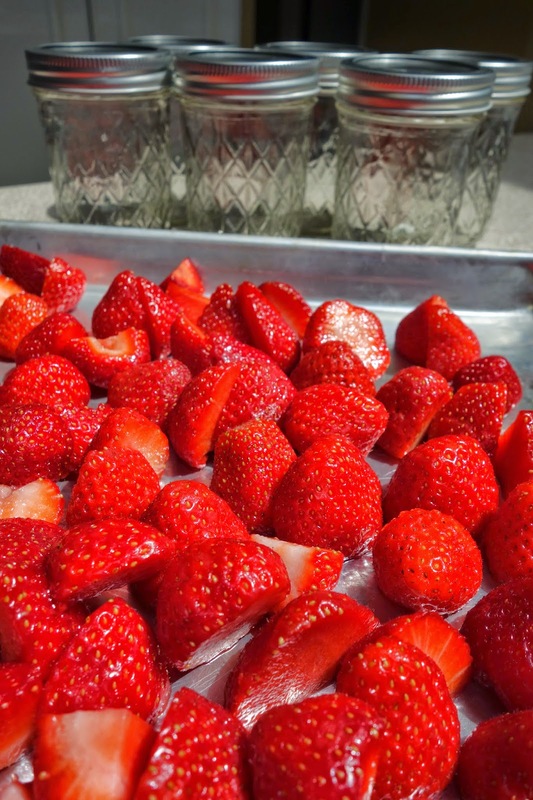 True strawberries – and by that, I mean strawberries that are locally grown and begin to ripen to perfection in early June – are just a fleeting moment in the landscape of summer. 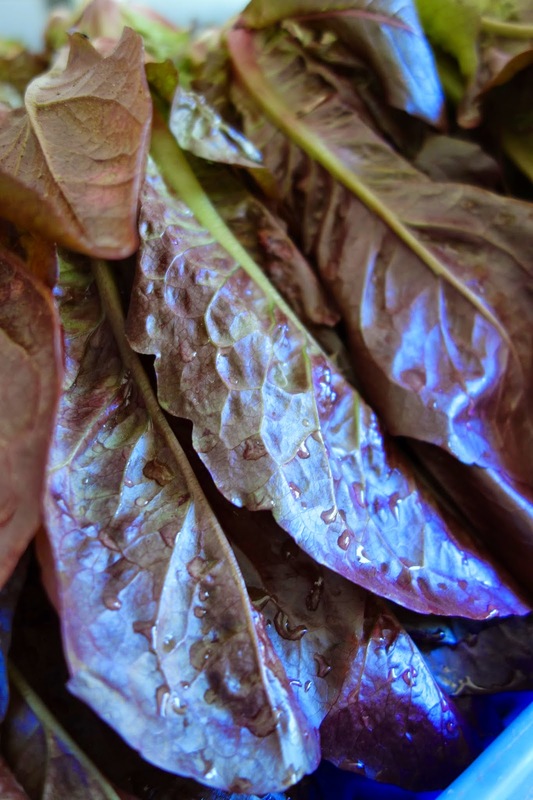 Lasting only two to three weeks, they are deeply red to the core, and drenched with sweet, sunny flavor. More and more I realize that these ephemeral moments are something to protect and preserve. 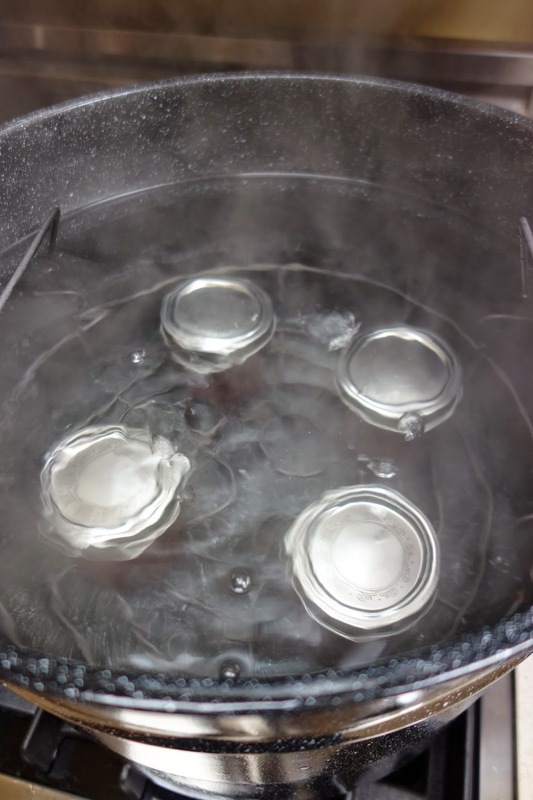 Perhaps that’s why I have gravitated towards home canning. 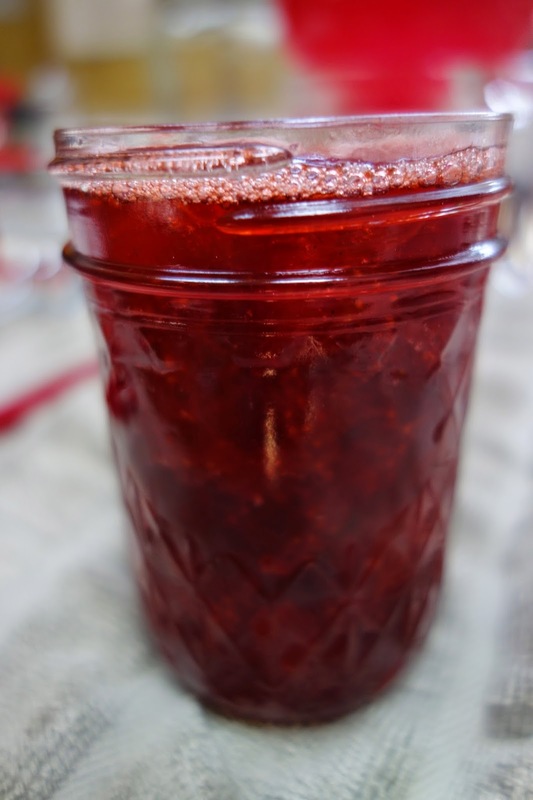 A spoonful of homemade jam from a jar evokes a whole raft of memories. It goes far beyond capturing the sweet flavor of the fruit. It recalls the sun on your back and the sweat on your brow as you walk through the fields at Restoration Farm. It’s the buzzing of honeybees and the glimpse of a red-winged blackbird. It’s the conversations with friends in the field, and the reminder that despite the fact that a growing season is always advancing towards an autumnal finale, time just seems to move a little more slowly at the farm. 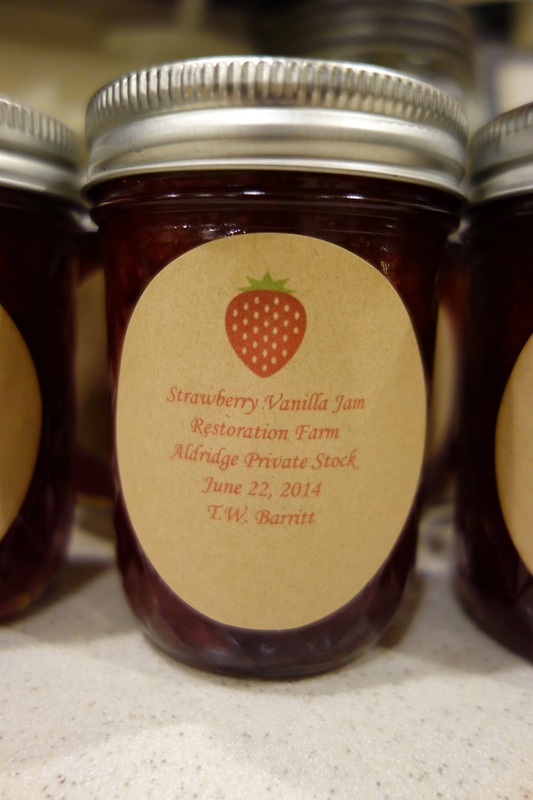 It’s been a glorious start to summer, and a strawberry jam project was inevitable. 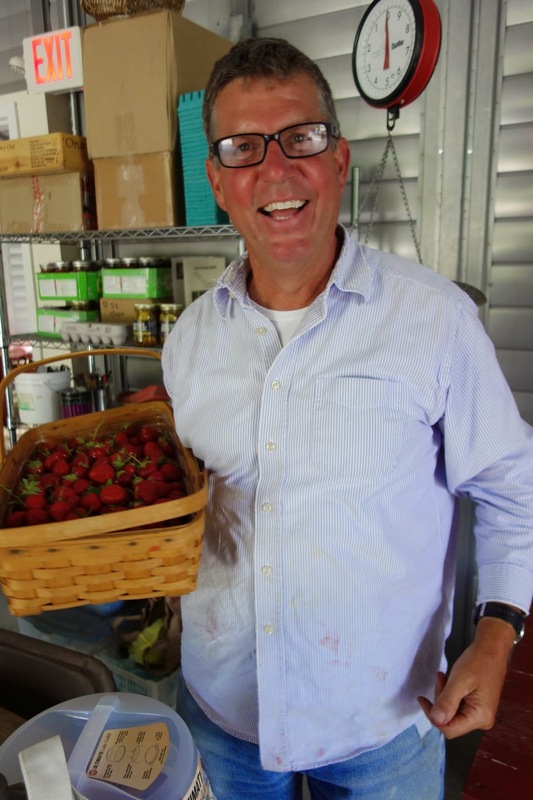 The strawberries come from Restoration Farm’s Glenn Aldridge, who this year cultivated a separate field of strawberries at the Old Hewlett Apple Orchard in Old Bethpage Village Restoration, which he’s been restoring and cultivating for several years now. It is hardly hyperbole to say that you can taste Glenn’s caring nature in these beautiful berries. He gives me far more berries than the recipe requires, so my kitchen becomes the site of a strawberry jamboree. 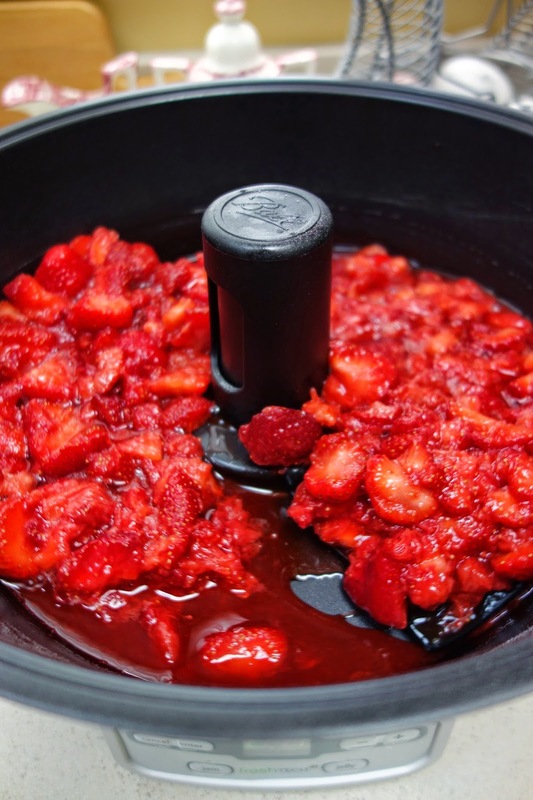 To prepare the jam, I use my Ball Automatic Jam & Jelly Maker, which is calibrated to cook at just the right temperature. The reduced sugar recipe is formulated specifically for use with this device, and contains more fruit and more intense strawberry flavor. As the jam simmers, my memory is at work. The aroma of warm strawberries instantly transport me to summers past, enjoying hot popovers slathered with jam on the banks of Jordan Pond at Acadia National Park. The final yield is eight jars of memories in two varieties – Strawberry Vanilla Jam infused with vanilla bean, and Strawberry Lemon Jam spiked with lemon zest. Bright Summer lives once more. Still in my robe, I greet Summer on my backyard deck with a steaming earthenware mug of coffee in hand. There is still a chill in the air as Summer slips back into our lives. I am tempted to chide her for taking her own sweet time in returning, but that would be ungracious. She is here for such a short time. Summer’s smile warms me to the core of my being. We take a few minutes to get reacquainted, and chat about how to spend this, the longest day of the year. 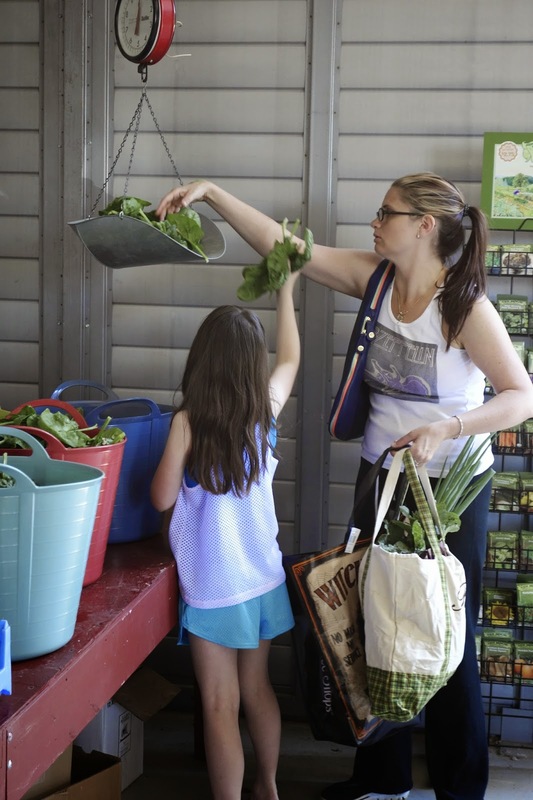 At Restoration Farm, Summer’s visit is welcomed with open arms. The fields yield whimsical radishes and crisp white turnips in celebration of the event. 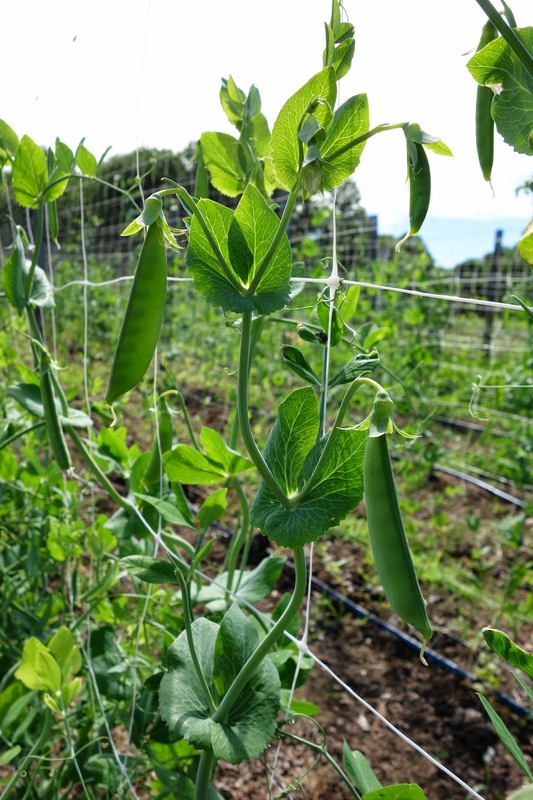 The snap peas greet Summer with a burst of emerald green and a sweet snap of flavor. Farm members emerge from hibernation. 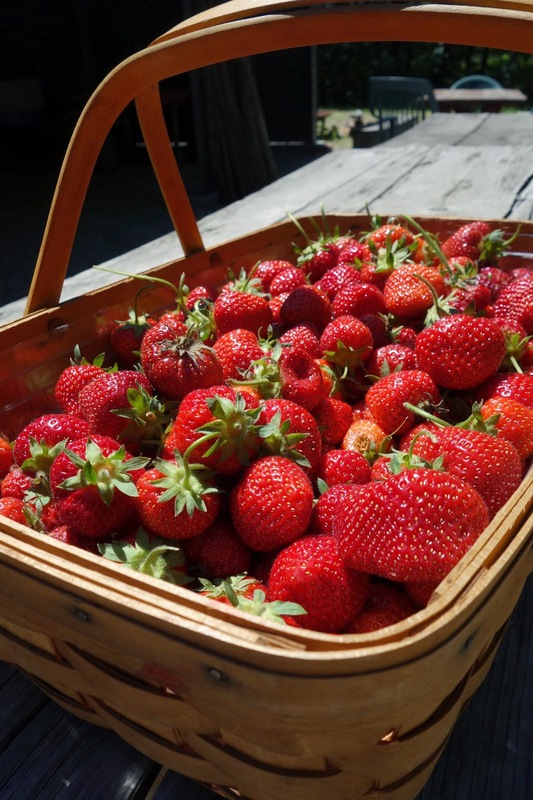 They gather in the field to pick luscious red strawberries and reunite with each other, buzzing about the potential of the season. Head Grower Dan Holmes plows the fields to expose the earth to the heated passion of Summer’s smile. 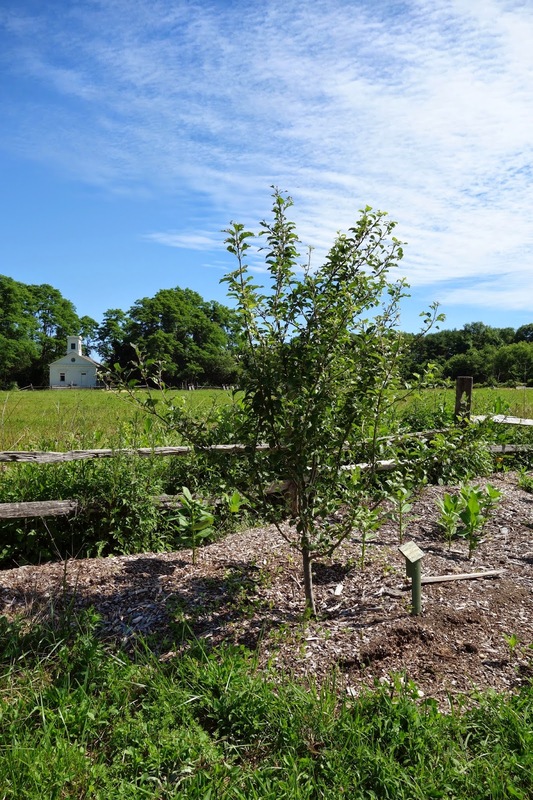 At Apple Trace, the eight heritage apple trees planted in memory of my Dad welcome their third summer standing tall, covered in vibrant green leaves. The new additions to the farm – two charcoal gray pastured piglets from Amish country in Pennsylvania – lounge happily in the balminess of Summer’s playful gaze. 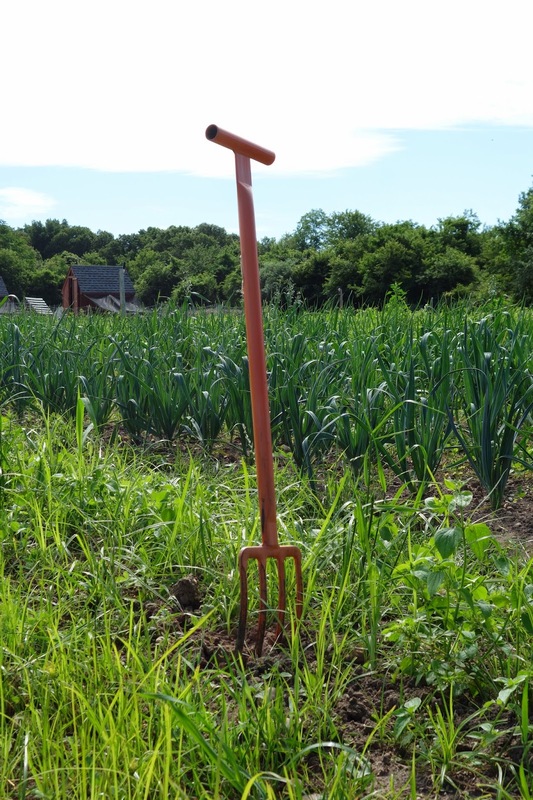 Theirs will be a jovial season of foraging and tilling the soil of the fields to their heart’s content. Gentleman farmer, George Garbarini – brown from the sun and now well into his eighth decade of mercurial summers – is busy assuring the grass is clipped and the fields look their best for the solstice celebration. 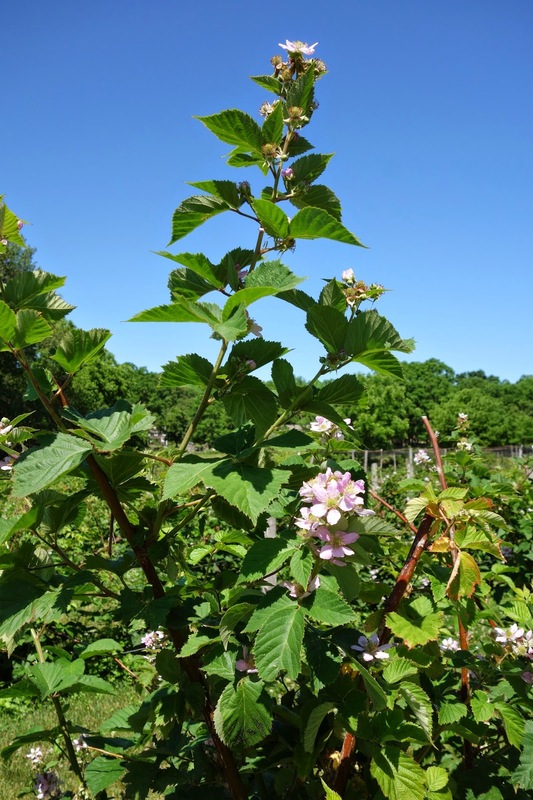 The blackberry bushes clothe themselves in buoyant pink blossoms – with no hint of their darker mood to come. Summer’s smile warms the fields, the farmers and members of Restoration Farm alike. We revel in her visage knowing too well that her visit will be far too brief. That first blush of green that accompanies the initial distribution of the season at Restoration Farm is always invigorating – bright, crisp, vibrant greens that kick-start the body and the soul. 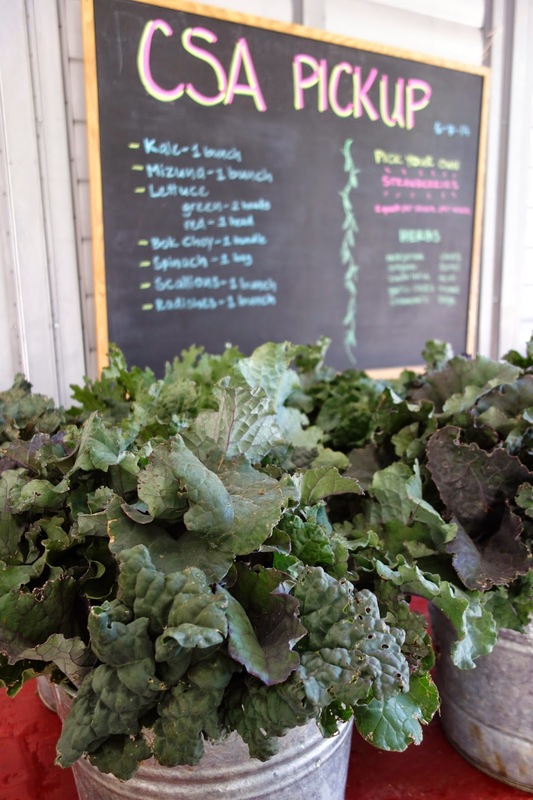 The youthfulness of the season is evident in curly kale, green lettuce, mizuna and bok choy. 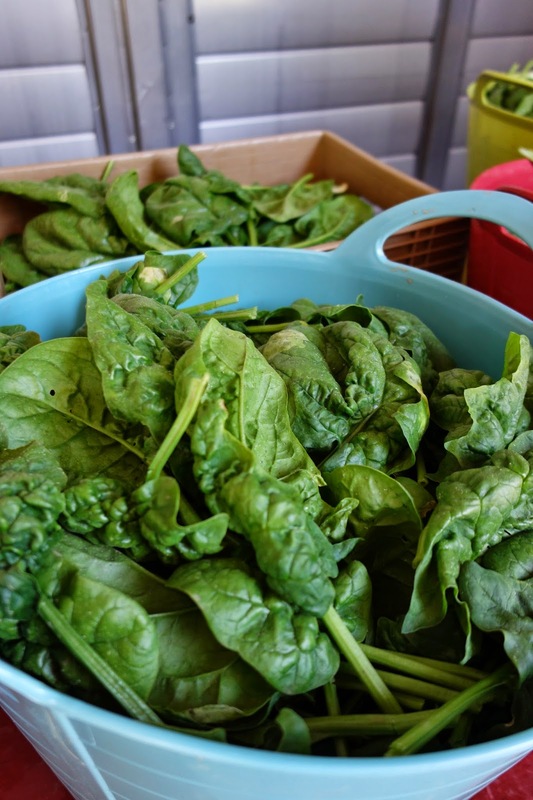 A bumper crop of fresh spinach overflows from bright hampers. Amid the sea of greens, there are some welcomed interlopers – pert radishes and dark red lettuce. All is green, and bursting with life. 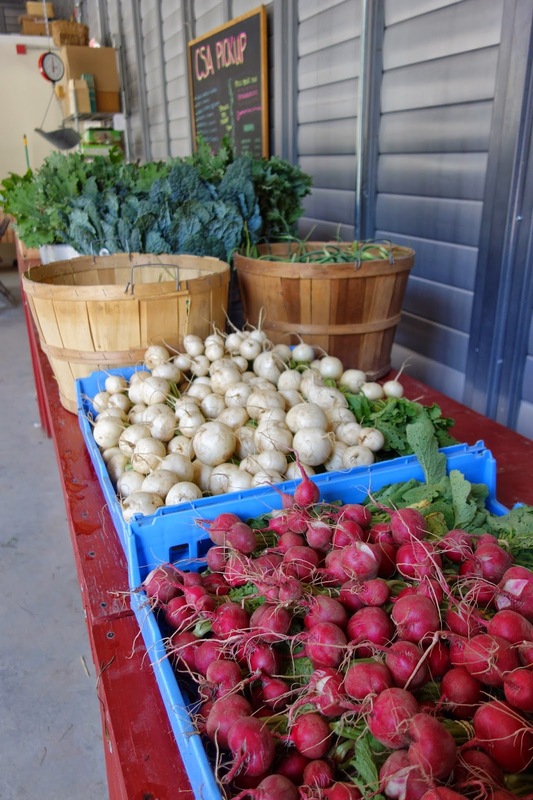 The Tin House – the new distribution center for vegetables – welcomes scores of enthusiastic members with canvas bags in hand. We have waited such a long time. 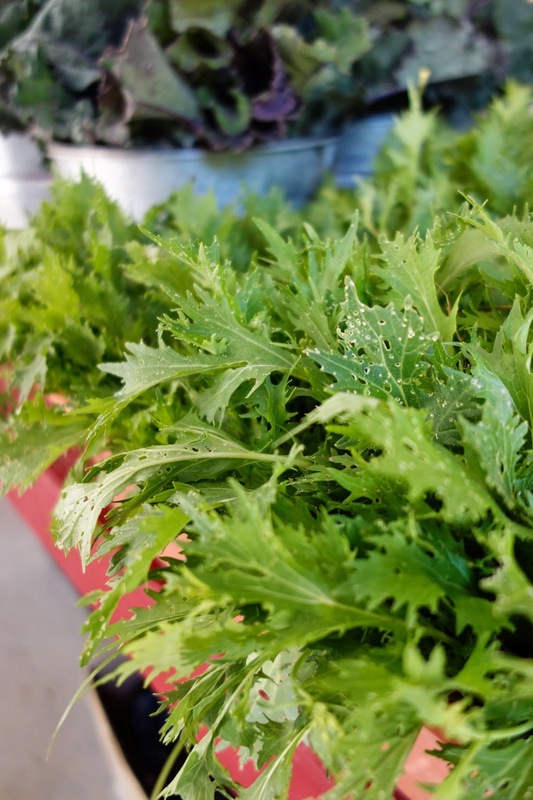 Here’s to the salad days that lie ahead! ©2014 T.W. Barritt All Rights Reserved. Ah, the weekend! Time to put aside the demands of the workweek and reconnect with the world outside the office. 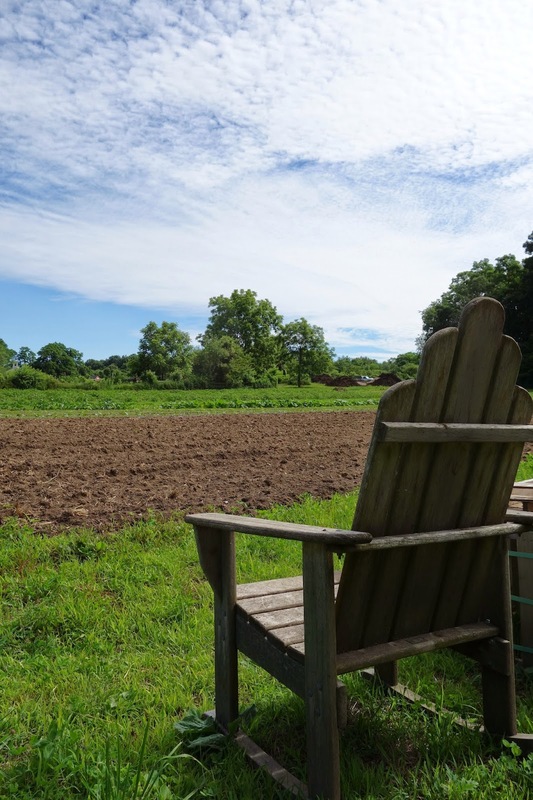 The weekend is a perfect time to explore the simple pleasures of Restoration Farm. Tucked into every corner of the farm, there’s a new discovery to be found. A sun-drenched visit is a feast for the senses. 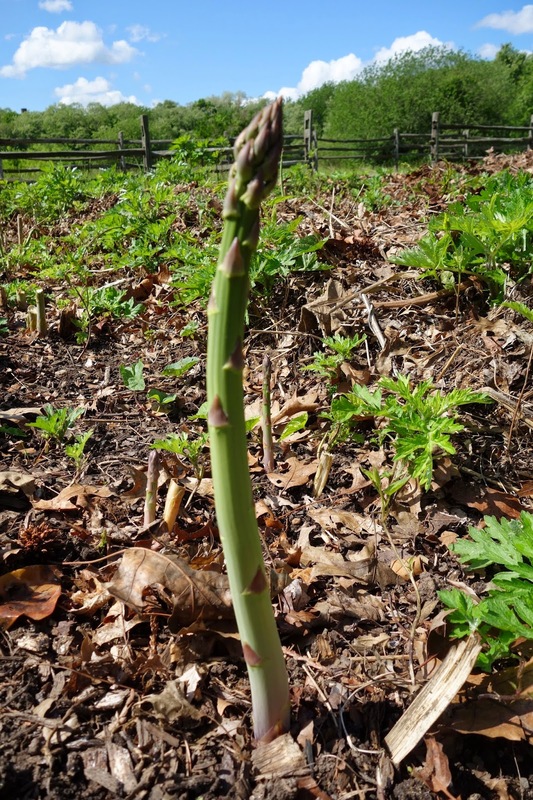 Not many realize that the asparagus field is just to the side of the dirt road leading to the historic Powell homestead. This farmland was first purchased from Native Americans in 1695. 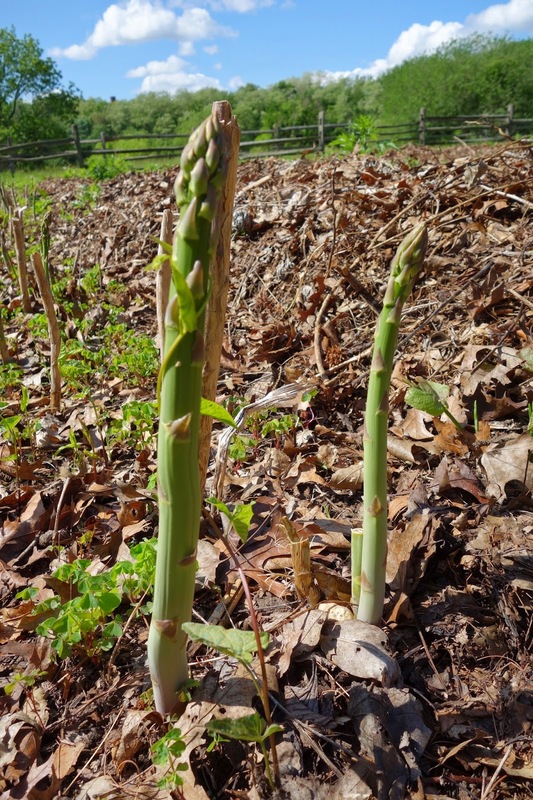 Poking out of mounds of soil and mulch are thick green stalks of asparagus. 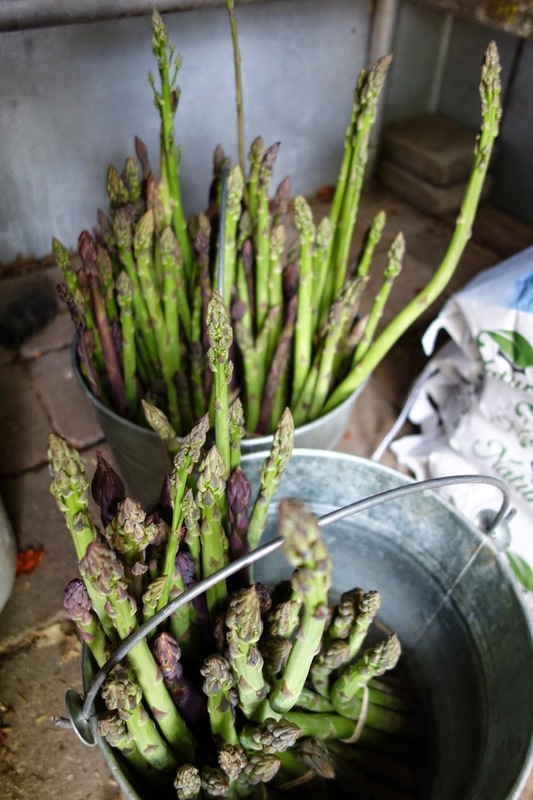 Asparagus is a flowering perennial, and these are as local as local gets. They decorate the field like sharp pencils emerging from the earth. Back at the storage cooler, there are fat packets of asparagus waiting for members to take home. They will be enjoyed for dinner, sprinkled with salt and pepper, drizzled with olive oil and simply roasted. Nearby, the brilliant red baubles of the strawberry field are peaking out from beneath bright green leaves. 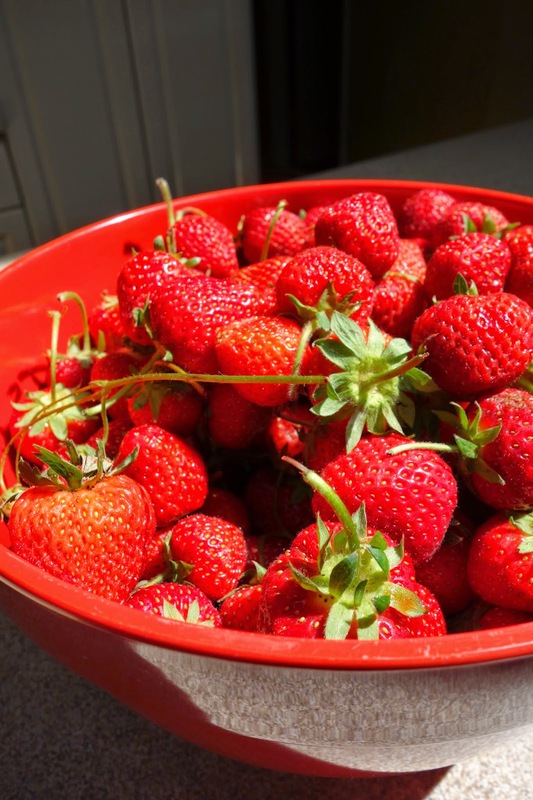 The strawberry season is a bright and shining moment at the start of the summer. I get to the field early to pick a pint. The berries are still sprinkled with raindrops from last night’s passing storm. Warmed by the sun, red through-and-through and impossibly sweet, here too, simplicity is key to enjoying these homegrown strawberries. No need for extra adornments. We’ll just slice them up and scatter them over a piece of rich, citrusy pound cake. Restoration Farm stimulates all of the senses – not just sight, smell and touch and taste, but hearing as well. 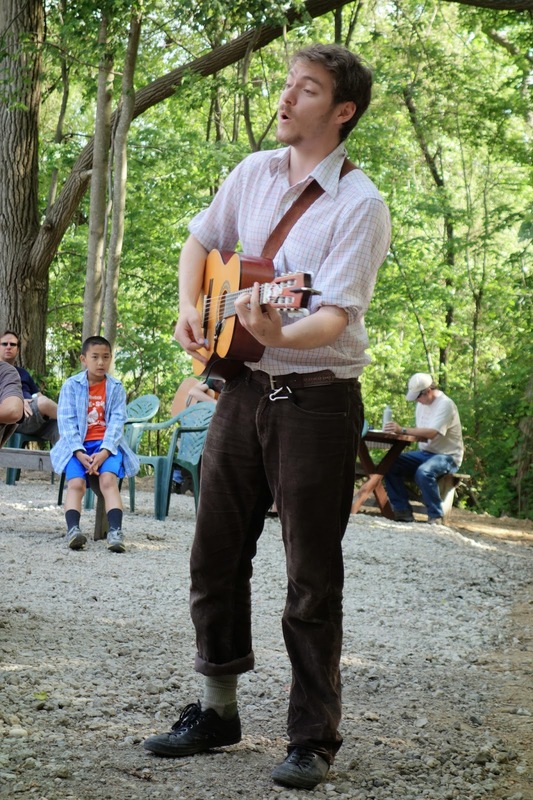 The cluck of a heritage hen, the grind of a tractor, and even the strum of a guitar or the twang of a fiddle invite us to reconnect with our soul and the world. 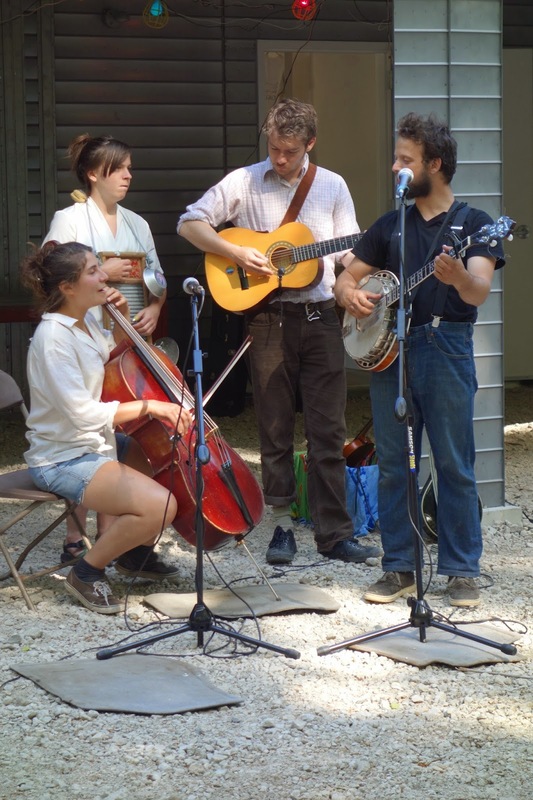 At the Tin House, the musical group “The Live Cultures” is performing a set of folk, blues and traditional Appalachian tunes. The music is restorative and the band’s spirit and enthusiasm is infectious. 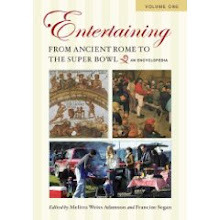 As they are all about “live cultures” the musicians even bring along some sourdough starter for sale, and tell a few ripe fermentation jokes - what did the bacteria say to the beer? It’s the yeast I could do! Monday morning seems a million miles away.